Ary Scheffer (10 February 1795 – 15 June 1858) was a Dutch-French Romantic painter. In 1830 Scheffer had a daughter Cornelia. He registered the name of her mother as Maria Johanna de Nes, but nothing is known about her and she may have died soon after Cornelia's birth. Considering that his own grandmother's name was Johanna de Nes, it has been speculated that he kept Cornelia's mother's name a secret not to compromise a noble family's reputation. Cornelia Scheffer (1830–1899) became a sculptor and painter in her own right. 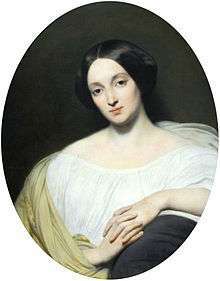 Scheffer's mother did not know of her namesake granddaughter until 1837, after which she took care of her until she died only two years later. 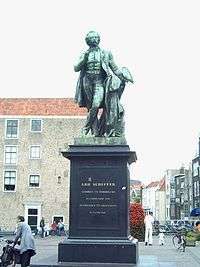 Scheffer became associate member of the Royal Institute of the Netherlands in 1846, and resigned in 1851. Scheffer was made commander of the Legion of Honour in 1848. As a captain of the Garde Nationale he escorted the royal family in their escape from the Tuileries and escorted the Duchess d'Orléans to the Chambre des Députés where she in vain proposed her son to be the next monarch of France. Scheffer fought in the army of Cavaignac during the popular uprising in Paris, but he was so shocked by the cruelty and hatred from the government's side and the misery of the lower classes that he withdrew from political activity and refused to make portraits of the family of Napoléon III. On March 16, 1850 he married Sophie Marin, the widow of General Baudrand, and on November 6 of that year he finally became a French citizen. 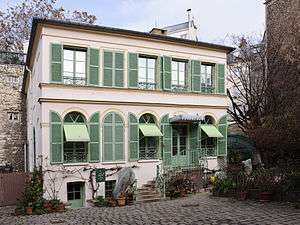 He continued his frequent travels to the Netherlands, and made trips to Belgium, Germany and England, but a heart condition slowed him down and eventually ended his life in 1858 in his summer house in Argenteuil. 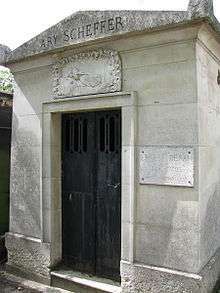 He is buried in the Cimetière de Montmartre. 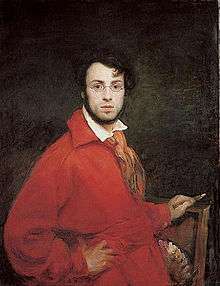 Scheffer often painted subjects from literature, especially the works of Dante, Byron and Goethe. Two versions of Dante and Beatrice have been preserved at Wolverhampton Art Gallery, United Kingdom, and Museum of Fine Arts, Boston, US. Particularly highly praised was his Francesca da Rimini, painted in 1836. Ary Scheffer’s The Shades of Francesca di Rimini and Paolo Malatesta Appearing to Dante and Virgil illustrates a scene from one of the world’s most renowned epics, Dante Alighieri’s Inferno. In the piece the entwined bodies of Francesca di Rimini and Paolo Malatesta swirl around in the never-ending tempest that is the second circle of Hell. The illusion of movement is created by the drapery that envelopes the couple, as well as by Francesca’s flowing hair. These two figures create a diagonal line that intersects the majority of the canvas creating not only a sense of movement, but also giving the painting an air of instability. Francesca clings to Paolo as he turns his face away in anguish. As one looks closely she can see that there are an additional two figures in the image. 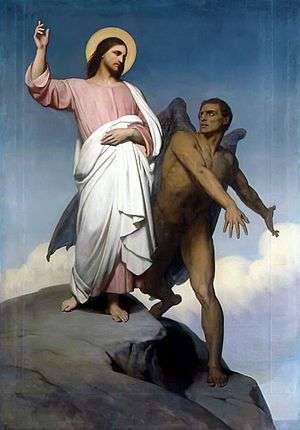 Hidden in the background, the poets Dante and Virgil look on as they make their way through the nine circles of Hell. Scheffer's popular Faust-themed paintings include Margaret at her wheel; Faust doubting; Margaret at the Sabbat; Margaret leaving church; The garden walk, and Margaret at the well. In 1836, he painted two pictures of Goethe's character Mignon. ↑ Wood, James, ed. (1907). "Scheffer, Ary". The Nuttall Encyclopædia. London and New York: Frederick Warne. 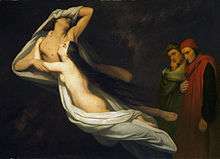 ↑ "A. Scheffer (1795 - 1858)". Royal Netherlands Academy of Arts and Sciences. Retrieved 17 July 2015. ↑ Murray, P. & L. (1996), Dictionary of art and artists. Penguin Books. ISBN 0-14-051300-0. 1 2 Reynolds, Francis J., ed. (1921). "Scheffer, Ary". Collier's New Encyclopedia. New York: P.F. Collier & Son Company. This article incorporates text from a publication now in the public domain: Chisholm, Hugh, ed. (1911). "Scheffer, Ary". Encyclopædia Britannica (11th ed.). Cambridge University Press.